The prevailing paradigm of host-parasite evolution is that arms races lead to increasing specialisation via genetic adaptation. Insect herbivores are no exception and the majority have evolved to colonise a small number of closely related host species. Remarkably, the green peach aphid, Myzus persicae, colonises plant species across 40 families and single M. persicae clonal lineages can colonise distantly related plants. This remarkable ability makes M. persicae a highly destructive pest of many important crop species. To investigate the exceptional phenotypic plasticity of M. persicae, we sequenced the M. persicae genome and assessed how one clonal lineage responds to host plant species of different families. We show that genetically identical individuals are able to colonise distantly related host species through the differential regulation of genes belonging to aphid-expanded gene families. Multigene clusters collectively upregulate in single aphids within two days upon host switch. Furthermore, we demonstrate the functional significance of this rapid transcriptional change using RNA interference (RNAi)-mediated knock-down of genes belonging to the cathepsin B gene family. Knock-down of cathepsin B genes reduced aphid fitness, but only on the host that induced upregulation of these genes. Previous research has focused on the role of genetic adaptation of parasites to their hosts. Here we show that the generalist aphid pest M. persicae is able to colonise diverse host plant species in the absence of genetic specialisation. This is achieved through rapid transcriptional plasticity of genes that have duplicated during aphid evolution. Parasites often exhibit a high degree of specialisation to a single or reduced range of host species [1, 2]. This is especially true for insect herbivores, of which there are around 450,000 described species living on around 300,000 species of vascular plants, the majority of which are monophagous or oligophagous, being able to colonise only one or a few closely related plant species . Acute specialisation of parasites is likely due to the complex relationships that occur between the parasites and their hosts, with increasing specialisation being driven by co-evolutionary arms races [4, 5]. In the case of herbivorous insects, the plant–insect interface represents a dynamic battleground between host and parasite, in which insect effector genes evolve to subvert plant defences and plant resistance genes evolve to detect infection and guide plant immunity [6, 7]. Despite the tendency for parasites to evolve highly specialised relationships with their hosts, occasionally, genuine generalist species with broad host ranges have evolved. For example, clonally produced individuals of the parasitic trematode Maritrema novaezealandensis are able to colonise a broad range of crustacean species  and the giant round worm Ascaris lumbricoides, which causes Ascariasis and infects an estimated 0.8 billion people worldwide, is able to infect both humans and pigs . Often, however, generalist parasite species have turned out to be cryptic specialists, made up of host adapted biotypes / races or cryptic species complexes [10–12]. For example, the pea aphid Acyrthosiphon pisum is considered polyphagous, being found on most plants of the Fabaceae, but actually consists of different biotypes on a continuum of differentiation that colonise specific species of this plant family . In another example, phylogenetic analysis of Aphidiinae parasitoid wasps showed that nearly all species previously categorised as generalists were in fact cryptic, host specialised, species complexes . Even when the occurrence of true generalist species has been demonstrated, a degree of host specialisation may be inevitable. In the generalist oomycete plant pathogen Albugo candida, host adapted races suppress plant immunity which facilitates colonisation by non-specialist lineages providing opportunities for gene flow (or genetic introgression) between host races, enabling host range expansion . As such, genuine generalists remain rare and how such parasites manage to keep up in multilateral co-evolutionary arms races remains an evolutionary enigma. The green peach aphid Myzus persicae is an extreme example of a genuine generalist, being able to colonise more than 100 different plant species from 40 plant families . As in many other aphid species, M. persicae has a complex life cycle that consists of both sexual and parthenogenetic (clonal) stages. Sexual reproduction occurs in autumn on Prunus spp. and produces overwintering eggs from which parthenogenetically reproducing nymphs emerge in the spring [17, 18]. These clonally reproducing individuals soon migrate to an extraordinarily diverse range of secondary host species, including many agriculturally important crop species . In areas where Prunus spp. are mostly absent, such as in the UK, M. persicae becomes facultatively asexual, remaining on its secondary hosts all year round . In both cases, clonal populations of M. persicae are found on diverse plant species. For example, M. persicae clone O populations are found on multiple crop species in the UK and France, including Brassica species, potato and tobacco (, J.C. Simon, personal communication). To investigate the genetic basis of generalism in M. persicae, we sequenced the genomes of two M. persicae clones, G006 from the USA and O from the UK and the transcriptomes of clone O colonies reared on either Brassica rapa or Nicotiana benthamiana. These two plant species produce different defence compounds shown to be toxic to insect herbivores [21, 22] presenting distinct challenges to aphid colonisation. Here we provide evidence that the transcriptional adjustments of co-regulated and aphid-expanded multiple member gene families underpin the phenotypic plasticity that enables rapid colonisation of distinct plants by M. persicae clone O. To generate a high-quality M. persicae genome assembly we sequenced a holocyclic line of the US clone G006  using a combination of Illumina paired-end and mate-pair libraries (Additional file 1: Table S1). The size of the assembled M. persicae genome was 347 Mb including ambiguous bases, representing over 82% of the total genome size as estimated from a kmer analysis of the raw reads (421.6 Mb). The assembly consists of 4018 scaffolds > 1 kb with an N50 scaffold length of 435 Kb (contig N50 71.4 kb) and an average coverage of 51× (Table 1). A total of 18,529 protein-coding genes (30,127 isoforms) were predicted using an annotation workflow incorporating RNA sequencing (RNA-seq) and protein alignments. We also generated a draft assembly of M. persicae clone O, the predominate genotype in the UK . The clone O genome was independently assembled to a size of 355 Mb with 18,433 protein-coding genes (30,247 isoforms) annotated, validating the genome size and number genes identified in the G006 assembly (Table 1). Contiguity of the clone O assembly was lower than that of G006, with the assembled genome containing 13,407 scaffolds > 1 Kb and having an N50 scaffold length of 164 Kb (contig N50 59 kb). In addition to protein-coding genes, we also identified 125 microRNA (miRNA), 273 tRNA and 69 rRNA genes in the M. persicae genome. Completeness of the M. persicae assembled genome was assessed through analysis of 248 core eukaryotic genes (CEGMA)  and 1349 genes conserved in arthropods; greater than 94% of the test genes were identified as complete in the clone O and G006 assemblies. Additionally, we assembled the M. persicae transcriptome de novo (i.e. without using the genomic reference) generating 79,898 M. persicae transcripts (greater than 1 kb), over 90% could be aligned to the genomic reference with high stringency (minimum 70% coverage and 95% identity). Together these results indicate that a high percentage of the gene space is represented in the two M. persicae assemblies. We found 97% of the G006 gene models to be present in a single contig rather than divided across multiple contigs. Higher level scaffolding will therefore have little effect on improving transcript completeness. Of the predicted genes, more than 70% were categorised as complete via alignment to UniProt proteins. Full details of the assembly, annotation and validation of both genomes are given in Additional file 2. A global analysis of the metabolism enzymes of M. persicae was generated based on the annotated gene models (Additional file 3) and is available in the ArthropodaCyc metabolic database collection (http://arthropodacyc.cycadsys.org/) . Metabolic reconstruction in A. pisum has highlighted the metabolic complementarity between the aphid and its obligate bacterial symbiont, Buchnera aphidicola, with the symbiont generating essential amino acids for the aphid . We compared the amino acid metabolism pathways identified in the two clones of M. persicae with those previously identified in A. pisum [27, 28]. A. pisum and the two M. persicae gene sets share 170 enzymes belonging to known amino acid metabolism pathways. A. pisum has 22 enzymes that were not found in either of the two M. persicae gene sets and M. persicae has 13 enzymes that were not found in A. pisum. As previously shown in A. pisum, the M. persicae amino acid metabolism pathways appear complementary with that of B. aphidicola. Also, similar to A. pisum and Diuraphis noxia [26, 29], M. persicae lacks the tyrosine (Tyr) degradation pathway that is present in all insects included in ArthropodaCyc at the time of writing, indicating that the lack of this pathway may be common feature of aphids. As such, the ability of M. persicae to colonise multiple plant species is unlikely to involve specific metabolic pathways that are absent in more specialised aphids. To investigate gene family evolution in aphids and to understand if specific gene repertoires may contribute to M. persicae ability to have a broad plant host range, we conducted a comparative analysis of M. persicae genes with those of the specialist aphid A. pisum and 19 other arthropod species. Genes were clustered into families based on their protein sequence similarity using the Markov Cluster Algorithm (MCL)  (Additional file 4: Table S2). Herein, unless otherwise stated, we use the term ‘gene family’ to represent clusters generated by MCL. Phylogenetic relationships and relative divergence times among the included taxa were inferred based on 66 strict, single-copy orthologs found in all species [31, 32] (Fig. 1; Additional file 5: Figure S1). With the exception of the placement of Pediculus humanus, all phylogenetic relationships received maximum support and are in agreement with a recently published large-scale phylogenomic study of insects . Annotation of the M. persicae genome reveals a gene count approximately half that of the specialist aphid A. pisum and similar to that of other insect species (Fig. 1), implying that the massive increase in gene content observed in A. pisum  may not be a general feature of aphid species. Using our comparative dataset, we find that the larger gene count of A. pisum compared to M. persicae is explained by two features, an increase in lineage-specific genes and widespread duplication of genes from conserved families (Fig. 1). A. pisum has approximately four times the number of lineage-specific genes than M. persicae (8876 versus 2275) and a greater number of genes in families with patchy orthology relationships across insects (5628 versus 7042, respectively). The higher number of broadly conserved genes in A. pisum is due to widespread gene duplication rather than differential loss of whole gene families in M. persicae with 75% (3336 / 4406) of A. pisum gene families that have patchy orthology in arthropods also found in M. persicae. Furthermore, the mean size of these families has increased by 82% in A. pisum (3.55 versus 1.95, Mann–Whitney U p < 0.00005). This is underlined by the pattern across all genes, with A. pisum having a significantly higher proportion of multi-copy genes than M. persicae (23,577 / 36,193 in A. pisum versus 9331 / 18,529 in M. persicae, Chi-square test: χ2 = 1220.61, d.f. = 1, p = 2.02 × 10−267). In addition to the differences observed between the two aphid species, there also appears to have been considerable change in gene content during aphid evolution relative to other insect orders. After accounting for evolutionary divergence, the rate of accumulation of aphid-specific genes is higher than the accumulation of lineage-specific content in any other insect order (Fig. 1). These genes are enriched for biological processes including detection and response to chemical stimuli, metabolic regulation and regulation of transcription, processes likely important in aphid evolution and diversification (Additional file 6: Figure S2 and Additional file 7: Table S3). Modelling of gene gain and loss in widespread gene families across the arthropod phylogeny also highlights the dynamic pattern of gene family evolution in aphids (Additional file 8: Figure S3). After correcting for evolutionary distance between species, A. pisum has the highest rate of gene family expansion of any arthropod species (Additional file 8: Figure S3). M. persicae has also undergone a relatively high number of gene family expansions over a short period of time compared to other arthropod species, but has significantly fewer expanded gene families than A. pisum (114 / 4983 versus 538 / 4983; Chi-square test: χ2 = 295.03, d.f. = 1, p = 3.984 × 10−66), and overall it has undergone a net decrease in gene family size. As such, gene gain in M. persicae appears to be restricted to a smaller subset of gene families than in A. pisum. This was also confirmed using a more inclusive set of gene families (6148 families found in both aphids as well as at least one other species) with a binomial test to identify significant expansion (173 / 6148 versus 391 / 6148; Chi-square test: χ2 = 88.31, d.f. = 1, p = 5.59 × 10−21). Interestingly, 85% of gene family expansions in M. persicae were shared with A. pisum. This suggests that a subset of M. persicae gene families may have been selected to retain high ancestral copy number or have experienced parallel, lineage-specific duplication against a background of reduced expansion genome wide. Full details of all expanded families are given in Additional file 9: Table S4. Differences in overall gene count and patterns of gene family evolution between M. persicae and A. pisum may be the result of a shift in gene duplication rate, altered selective regimes acting on duplicate retention (i.e. genome streamlining) or a combination of the two. To test this, we conducted a synonymous (d S ) and non-synonymous (d N ) substitution rate analysis and found evidence of increased genome streamlining in the generalist aphid M. persicae (Fig. 2a and Additional file 10: Figure S4). The age distribution of paralogs in M. persicae and A. pisum shows that gene duplicates have accumulated steadily in both species with a continuing high rate of duplication (Fig. 2a). However, we observe marked differences in the retention rates of ancestrally duplicated genes between the two species. Using average d S between M. persicae and A. pisum 1:1 orthologs (d S = 0.26) as a cutoff to identify ancestral (pre-speciation) duplicates, we find a significantly greater loss rate in M. persicae than A. pisum. In A. pisum, we found 382 genes that duplicated before speciation and, of those, M. persicae has lost one or both paralogs in 224 families (59% loss). We detected 285 families that duplicated before speciation in M. persicae and, of those, 69 families lost one or both paralogs in A. pisum (24% loss) (Chi-square test: χ2 = 78.55, d.f. = 1, p = 7.82 × 10−19). Consistent with genome streamlining, we also observe stronger purifying selection in ancestral duplicates retained in M. persicae than in A. pisum (Fig. 2b and Additional file 10: Figure S4). A phylome resource (the complete collection of gene trees) for M. persicae and all taxa included in the comparative analysis was also generated and is available for download or to browse at PhylomeDB . Gene trees were scanned to infer duplications and speciation events and to derive orthology and paralogy relationships among homologous genes . 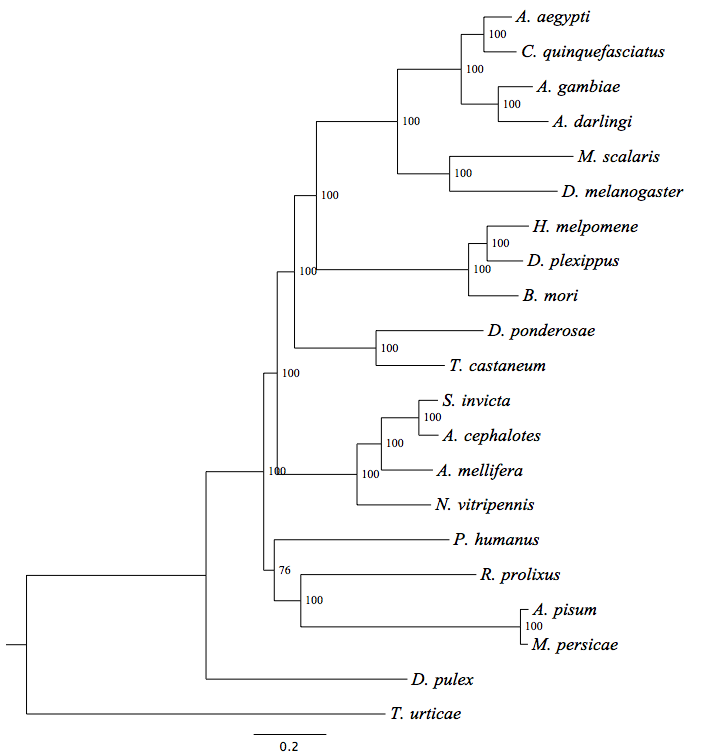 Duplication events were assigned to phylogenetic levels based on a phylostratigraphic approach  and duplication densities calculated on the branches of the species tree leading to M. persicae. In agreement with the comparative analysis above, a high rate of duplication was observed on the branch leading to M. persicae and A. pisum and relatively low rate of duplication observed in M. persicae (for full methods and results, see Additional file 11). In order to examine how genetically (near) identical M. persicae clones are able to colonise divergent host species, clone O colonies were started from single females and reared on B. rapa (Chinese cabbage, Brassicaceae) and subsequently transferred to N. benthamiana (Solanaceae). The two clonally reproducing populations were reared in parallel on these plants for one year and their transcriptomes sequenced. Comparison of these transcriptomes identified 171 differentially expressed (DE) genes putatively involved in host adjustment (DEseq, > 1.5-fold change, 10% false discovery rate (FDR); Fig. 3; Additional file 12: Table S5). The set of differentially expressed genes was significantly enriched for genes from multigene families compared to the genome as a whole (126 / 171 DE versus 9331 / 18,529 genome-wide (GW), Chi-square test: χ2 = 36,88, d.f. = 1, p = 6.92 × 10−10; Fig. 3a, c). Furthermore, many of the differentially expressed genes are from aphid-expanded or aphid-specific gene families (105 / 171 DE versus 3585 / 18,529 GW, Chi-square test: χ2 = 195.62, d.f. = 1, p = 1.89 × 10−44; Fig. 3c, for detailed annotation of all DE genes see Additional file 12: Table S5), highlighting the important role of aphid genomic novelty in M. persicae colonisation of diverse plant species. In most cases, gene families were uni-directionally regulated with 64 families upregulated on B. rapa and 36 families upregulated on N. benthamiana (Additional file 12: Table S5). Genes from only six families were bi-directionally regulated on the plant hosts. Of these, multiple genes of the UDP-glycosyltransferases, maltase-like, P450 monooxygenases and facilitated trehalose transporter Tret1-like were upregulated on B. rapa and single genes in each of these families on N. benthamiana (Additional file 12: Table S5). The cathepsin B cysteine protease and Rebers and Riddiford subgroup 2 (RR-2) cuticular protein  families, which have the highest number genes differentially expressed upon host transfer (Fig. 3a), typify the way M. persicae gene families respond to host transfer. Members of these families are uni-directionally regulated, with Cathepsin B genes upregulated in aphids reared on B. rapa and RR-2 cuticular proteins upregulated in aphids reared on N. benthamiana. Further annotation of the cathepsin B and RR-2 cuticular protein genes and phylogenetic analyses including other hemipteran species reveals that differentially expressed genes from these families cluster together in aphid-expanded and, in the case of cathepsin B, M. persicae-expanded clades (Fig. 4a; Additional file 13: Figure S5A). We also found that cathepsin B and RR-2 cuticular proteins regulated in response to host change are clustered together in the M. persicae genome with differentially expressed members forming tandem arrays within scaffolds (Fig. 4b and Additional file 13: Figure S5B). Differentially expressed UDP-glycosyltransferase, P450 monooxygenases and lipase-like are also arranged as tandem repeats (Additional file 14: Figure S6, Additional file 15: Figure S7 and Additional file 16: Figure S8) and, more generally, tandemly duplicated genes were over-represented among the differentially expressed genes (65 / 171 DE versus 1111 / 18,529 GW, Chi-square test, χ2 = 314.66, d.f. = 1, p = 2.10 × 10−70; Fig. 3b) highlighting the tendency of genes regulated in response to host change to be clustered in the M. persicae genome. In many parasites, recent, lineage-specific, gene family expansions have been implicated in host range expansion and transitions to generalism, for example in the nematode genus Strongyloides  and the ascomycete genus Metarhizium . We therefore tested for the presence of recently duplicated genes involved in M. persicae host colonisation (differentially expressed on host transfer) by estimating the coalescence times of these genes and comparing them to the aphid phylogeny. Contrary to our expectations, the analysis of pairwise substitution patterns between duplicated differentially expressed genes and their closest paralog show that these genes are older than the genome-wide average, with the differentially expressed gene set enriched for gene duplicates that arose before the divergence of M. persicae and A. pisum (paralog pairs d S 0.26–2.00: DE duplicated = 75 / 97, whole genome = 1348 / 2414, Chi-square test: χ2 = 15.87, d.f. = 1, p = 6.79 × 10−5) (Fig. 3d). In addition, we found that host-regulated genes appear to be under stronger purifying selection than the genome-wide average with paralog pairs containing at least one differentially expressed gene having median d N /d S significantly lower than for all paralog pairs in the genome (median d N /d S = 0.2618 versus 0.3338, Mann–Whitney U = 105,470, p = 1.47 × 10−4) (Fig. 3e, Additional file 17: Table S6). This suggests that most of the genetic variation utilised during host colonisation was present in the common ancestor of the two aphid species and, hence, Myzus-specific gene duplication per se does not represent the evolutionary innovation that enables a generalist lifestyle. To further investigate gene expression plasticity in M. persicae upon transfer to diverged hosts, we investigated differential gene expression of aphids transferred from B. rapa to N. benthamiana and allowed adjustment on their new hosts for seven weeks, this time also including a transfer from B. rapa to Arabidopsis thaliana. M. persicae clone O successfully colonised all three host species with no significant differences observed in survival and reproduction rates, weight, development time and longevity (Additional file 18: Figure S9A). This is in contrast to an A. pisum biotype collected from the legume Pisum sativum that had significantly reduced reproduction rates and increased developmental time and overall lower fitness on two other legume species (Medicago truncatula, Vicia villosa) compared to the ‘universal’ host (Vicia faba), which can be colonised by many pea biotypes . We analysed the differential expression of M. persicae clone O cathepsin B and RR-2 cuticular protein genes by quantitative real-time polymerase chain reaction (qRT-PCR) to assess if the upregulation and downregulation of these genes upon a host switch can be confirmed by a method other than RNA-seq and to develop an assay that can be used for analyses of differential gene expression in single aphids (see next step). All differentially expressed cathepsin B and RR-2 cuticular protein genes in the RNA-seq experiments for which specific primers could be designed (the majority) were also differentially expressed in the qRT-PCR experiments. Furthermore, we find similar expression patterns for aphids reared on Brassicaceae species with cathepsin B copies upregulated on B. rapa and A. thaliana relative to N. benthamiana (Fig. 4c) and RR-2 cuticular proteins downregulated (Additional file 13: Figure S5C). To investigate the speed of gene expression change upon host transfer, individual aphids (three-day-old nymphs) were transferred from A. thaliana to N. benthamiana and vice versa, or to the same host, and expression of cathepsin B and RR-2 cuticular protein genes measured after two days by qRT-PCR. Survival rates of the nymphs upon transfer to a different plant species was over 60% and the reproduction rates of these surviving aphids were similar to the aphids that did not experience a host change (Additional file 18: Figure S9B). In contrast, the A. pisum P. sativum biotype had a remarkable reduction in reproduction rates upon host change to the three legume plants M. truncatula, Vicia villosa and M. sativa and this aphid did not establish stable colonies on the latter legume . Cathepsin B gene expression went up in M. persicae transferred from N. benthamiana to A. thaliana and down in aphids transferred from A. thaliana to N. benthamiana (Fig. 4d, e). Conversely, expression of RR-2 cuticular protein genes went down in aphids transferred from N. benthamiana to A. thaliana and up in aphids transferred from A. thaliana to N. benthamiana (Additional file 13: Figure S5D, E). No significant change was observed when aphids were transferred to the same plant species (from A. thaliana to A. thaliana or N. benthamiana to N. benthamiana). Hence, expression levels of cathepsin B and RR-2 cuticular protein genes adjust quickly upon host change (within two days) and are regulated in a coherent, host-dependent fashion. To test whether targets of transcriptional plasticity in M. persicae have direct fitness affects, we conducted plant-mediated RNAi knockdown [41, 42] of cathepsin B genes identified as differentially expressed upon host transfer. We focused on cathepsin B as the majority (11 out of 12) of gene copies differentially expressed upon host transfer are located in a single, M. persicae expanded clade (Cath_Clade I) of the cathepsin B phylogeny (Fig. 4a) and have 69–99% nucleotide sequence identities to one another (Additional file 19). As such, a single dsRNA construct can be used to knock down multiple cathepsin B genes. In contrast, the clade containing the majority of differentially regulated RR-2 cuticular protein genes is larger and more diverse (Additional file 13: Figure S5), presenting a challenge for using the RNAi-mediated approach to examine how these genes act together to enable M. persicae colonisation. Three independent stable transgenic A. thaliana lines producing dsRNAs targeting multiple cathepsin B genes (At_dsCathB 5–1, 17–5 and 18–2; Additional file 19) were generated. The expression levels of all Cath_Clade I genes except MpCath12 were downregulated in M. persicae reared on these lines (Fig. 5a) in agreement with MpCath12 having the lowest identity to the dsRNA sequence (73% versus > 77% for other copies) (Additional file 19). Aphids on the three At_dsCathB lines produced about 25% fewer progeny (p < 0.05) compared to those reared on the At_dsGFP control plants (Fig. 5b) indicating that the cathepsin B genes contribute to M. persicae ability to colonise A. thaliana. To examine the impact of cathepsin B on the ability of M. persicae to adjust to host change, the cathB-RNAi aphids were transferred from At_dsCathB lines to non-transgenic A. thaliana and N. benthamiana plants and examined for survival and fecundity. In agreement with previous data , we found that the genes targeted by RNAi remain downregulated at two days upon transfer from At_dsCathB lines to non-transgenic plants (Additional file 20: Figure S10). Upon transfer to A. thaliana, the cathB-RNAi aphids had lower survival and reproduction rates than the dsGFP-exposed (control) aphids (Fig. 5c, e). In contrast, no decline in survival and reproduction was seen of the cathB-RNAi aphids compared to the dsGFP-exposed aphids upon transfer to N. benthamiana (Fig. 5d, f). Thus, cathB knock down impacts M. persicae fitness differentially depending on the host plant species. Together these data provide evidence that adjustment of the cathepsin B gene expression levels between A. thaliana and N. benthamiana contributes to the ability of M. persicae to colonise both plant species. So far, genomic studies of polyphagy and generalism have primarily focused on genetic adaptation and have led to the identification of specific genetic elements that are present in the genomes of one race (or biotype) versus another and that enable these races to be host-specific [13, 15, 28]. In such cases, while the species as a whole may be considered polyphagous, individuals are not. Here we have investigated the genome and transcriptome of the genuine generalist M. persicae. We demonstrate the striking ability of M. persicae to colonise divergent host plant species by conducting host transfer experiments using individuals from a single, clonally reproducing line (Clone O) and allowing them to adjust to three distinct host plant species from two plant families. We show that generalism in M. persicae is associated with rapid transcriptional plasticity of often aphid-specific gene copies from multi-gene families that are uni-directionally regulated. Furthermore, we show that disrupting the transcriptional adjustment of a gene family with high levels of differential expression upon host transfer (cathepsin B), using plant-mediated RNAi, has host-dependent fitness costs for M. persicae, suggesting that host-associated transcriptional plasticity is adaptive in M. persicae. Differential gene expression upon host transfer has also been observed in the legume specialist A. pisum [40, 43]. However, host switching in A. pisum is restricted to Fabaceae and successful transitions are only possible between a common host (Vicia faba) shared among all A. pisum biotypes and a second host, specific to each genetic lineage. Our results go further than these previous studies, directly linking gene expression differences to host dependent fitness benefits, demonstrating the importance of transcriptional plasticity in the generalist feeding habit of M. persicae. Contrary to expectations, the majority of genes differentially regulated upon host transfer originate from ancestral aphid duplication events rather than more recent lineage-specific duplications. Additionally, comparative analysis of all M. persicae gene families with other arthropods showed that, while gene family evolution appears to have been highly dynamic during aphid diversification, M. persicae does not exhibit widespread gene duplication on the scale of the legume specialist A. pisum. This is surprising given that other studies have shown a key role for lineage-specific gene duplication in parasite host range expansions [38, 39]. Although not extensive, recent gene duplication may still play a role in M. persicae host adaptation given that some gene families have undergone M. persicae-specific gene duplication against a background of reduced gene family expansion genome-wide. For example, the cathepsin B and UGT gene families have undergone M. persicae-specific gene duplication and are implicated in host adjustment. These observations are consistent with genome streamlining in M. persicae, with functionally important gene duplicates preferentially retained. It therefore seems likely that functionally important lineage-specific gene duplication combined with rapid transcriptional plasticity of a broader, aphid-specific gene repertoire, consisting of selectively retained gene duplicates, contributes to the generalist feeding habit in M. persicae. Transcriptional plasticity has also been implicated in host adjustment in generalist spider mite and butterfly species [44, 45]. This suggests a key role for transcriptional plasticity in plant-feeding arthropods that have evolved genuine generalism as opposed to cryptic sub-structuring of genetic variation by host species. The mechanisms by which this transcriptional plasticity is achieved are, as yet, unknown. However, given that in M. persicae differences in gene expression occur rapidly upon host transfer, and in the absence of genetic variation between host-adjusted lineages (experiments were performed with single aphids in the two-day transfer experiments and with clonally reproducing individuals derived from a single parthenogenetic female in the seven-week and one-year aphid colonies), epigenetic mechanisms of gene expression regulation are likely responsible. Full length copies of the DNA methyltransferase (DNMT) genes DNMT1a, DNMT1b, DNTM2, DNMT3a and DNMT3b and all components of the histone modification system are present in M. persicae, as is the case for other aphid species [29, 46, 47], and epigenetic mechanisms have been shown to regulate plastic traits such as hymenopteran caste-specific behaviour . Genes belonging to aphid-expanded clades of the cathepsin B and RR-2 cuticular protein gene families contribute the largest percentages of differentially regulated genes upon host transfer and are therefore likely to play a key role in the ability of M. persicae to colonise members of Brassicaceae and Solanaceae. Cathepsin B proteins may serve digestive functions [49, 50], but are also known virulence factors, as they play major roles in invasion and intracellular survival of a number of pathogenic parasites [50–53]. For example, RNAi-mediated knock down of Trypanosoma brucei cathepsin B leads to clearance of parasites from the bloodstream and prevents lethal infection in mice . In the social aphid Tuberaphis styraci, cathepsin B has been detected as a major component of the venom produced by soldier aphids which is expelled through the stylets and injected into potential predators . In M. persicae, three of the differentially expressed cathepsin B genes encode proteins with signal peptides, are expressed in the M. persicae salivary gland  and peptides corresponding to cathepsin B are found in proteome analyses of M. persicae saliva , suggesting they come into direct contact with plant components during feeding. Interestingly, cathepsin B genes involved in host adjustment have functionally diverged in M. persicae relative to other aphid species. Most of the differentially expressed cathepsin B genes belong to Cath_Clade_I, which has expanded in M. persicae relative to A. pisum and D. noxia (Fig. 4a). Functional analysis of genes in this clade shows that most M. persicae copies possess a complete cysteine peptidase domain consisting of a propeptide domain and both cysteine and histidine active sites. In contrast, most A. pisum and D. noxia copies have an incomplete cysteine peptidase domain (Additional file 21: Figure S11). This is in agreement with previous observations that cathepsin B genes are under selection in aphids . Our finding that cathepsin B genes are differentially regulated in response to M. persicae host transfer and that knock down of functionally diverged differentially expressed cathepsin B copies directly impacts M. persicae fitness in a host-dependent manner highlights the key role of this gene family in aphid evolution. Cuticular proteins bind chitin via extended version of the RR-1 and RR-2 consensus sequences and provide the cuticle with structural support, mechanical protection and mobility . Cuticular protein genes have different expression profiles depending on the insect body part, mechanical property needs, developmental stage, temperature and seasonal photoperiodism [59–62]. RR-1 proteins are associated mostly with soft and flexible cuticle and RR-2 proteins in hard and rigid cuticles [63, 64]. Members of the differentially regulated RR-2 cuticular proteins of M. persicae on different plant hosts have identical sequences as those shown to be associated with the acrostyle at the tip (last few microns) of the maxillary stylets of the M. persicae mouthparts where the food canal and salivary canals are fused . The acrostyle is in the part of the stylet that performs intracellular punctures during probing and phloem feeding  and has a high concentration of cuticular proteins. It also interacts with virus particles that are transmitted by M. persicae . Moreover, it is in direct contact with (effector) proteins of the aphid saliva and the plant cell contents, including the phloem sap . Therefore, it is possible that the differential regulation of RR-2 cuticular protein genes enables M. persicae to adjust to the different physical and chemical attributes of cell walls, their contents and defence responses of the diverged plant species. We found that M. persicae adjustment to diverged plant species involves the unidirectional co-regulation of multigene families that lie within distinct multi-gene clusters in the aphid genome. Differential expression of cathepsin B and RR-2 cuticular protein genes occurs rapidly, within two days, indicating strict regulatory control of these gene clusters. Furthermore, upregulation of aphid-specific cathepsin B gene copies enables M. persicae survival and fecundity on the new host. Taken together, this study of the genome sequence of M. persicae, comparative genome analyses and experimental study of host change have identified specific genes that are involved in the ability of M. persicae to colonise members of the Brassicaceae and has provided evidence that the rapid transcriptional plasticity of M. persicae plays a role in this aphid’s ability to adjust to diverged plant species. Clone G006 was collected from pepper in Geneva, NY, USA in 2003 . Since the time of collection, G006 has been maintained on Brassica oleracea var. Wisconsin golden acre seedlings in a growth chamber under long day conditions of 16 h light: 8 h of darkness at 20 °C constant temperature in the laboratory of Alexandra Wilson, University of Miami. Clone O is found on multiple crop and weed species in the UK and France [20, J. C. Simon, personal communication]. A colony of M. persicae clone O starting from a single female was established on Chine﻿se cabbage (B. rapa) in a growth chamber (14 h light, 10 h dark at constant 20 °C, 75% humidity) in﻿ 2010. The clone was subsequ﻿ently reared on B. rapa (Brassicaceae), A. thaliana (Brassicaceae) and N. benthamiana (Solanaceae) in the laboratory. A single paired-end library and two mate-pair libraries were constructed for the G006 clone with insert sizes of approximately 200 (S6), 2000 (S8 MPB) and 5000 (S7 MPA) bp and sequenced with 100 bp paired-end run metrics using a version 3 Illumina Hi-Seq paired-end flow cell to give ~95 Gb of sequencing reads. Illumina library construction and sequencing for clone G006 was performed at the University of Miami’s Center for Genome Sequencing Core at the Hussman Institute for Human Genomics. For the Clone O genome, three libraries were constructed, two paired-end libraries with an average fragment size of 380 (LIB1672) and 180 (LIB1673) bp and for scaffolding a mate-pair library with an average 8000 bp insert size (LIB1472). Libraries were prepared at the Earlham Institute (Norwich, UK) using the Illumina TruSeq DNA Sample Preparation Kit. The resulting DNA libraries were sequenced with 100 bp paired-end run metrics on a single lane of an Illumina HiSeq2000 Sequencing System according to manufacturer’s instructions. To aid gene annotation, total RNA was extracted from M. persicae clone G006 whole female insects (WI), bacteriocytes (dissected from 300 adults) and guts (dissected from 300 adults). All RNA was treated with DNaseI before sending for sequencing at the University of Miami’s Center for Genome Sequencing Core at the Hussman Institute for Human Genomics. Each sample was prepared for messenger RNA (mRNA) sequencing using an Epicenter PolyA ScriptSeqV2 kit. All sequencing was performed as 2 × 100 reads on a HiSeq 2000. Additionally, a directional library was constructed with RNA isolated from a mixture of M. persicae clone O asexual females at various developmental stages. Libraries were generated following the strand-specific RNA-seq method published by The Broad Institute  and sequenced to 100 bp on a paired-end flow cell on the Illumina HiSeq2000 (Illumina, USA). To identify genes involved in M. persicae host adjustment, we sequenced the transcriptomes of clone O colonies reared on B. rapa and N. benthamiana. Colonies were established from a single asexual female and reared under long-day conditions (14 h light, 10 h dark) and constant 20 °C and allowed to adapt for one year. Adult asexual females (one-week-old) were then harvested in pools of approximately 50 individuals. Three independent pools were harvested from each plant species and RNA extracted using Tri-reagent (Sigma) followed by DNAse digestion (Promega) and purification using the RNeasy kit (Qiagen). Samples were sent for sequencing at the Earlham Institute (Norwich, UK) where 1 ug of RNA was purified to extract mRNA with a poly-A pull down and six non-orientated libraries (LIB949-LIB954) constructed using the Illumina TruSeq RNA Library Preparation kit following manufacturer’s instructions. After complementary DNA (cDNA) synthesis, ten cycles of PCR were performed to amplify the fragments. Libraries were then pooled and sequenced on a single HiSeq 2000 lane generating 100 bp paired-end sequences. Details of all transcriptomic libraries generated for this study are given in Additional file 22: Table S7. RNA was extracted from 450 M. persicae nymphs using Tri-Reagent (Sigma). A small RNA library was prepared following the Illumina Small RNA v1.5 Sample Preparation protocol (Illumina Inc, San Diego, CA, USA). Ligation of the 5’ and 3’ RNA adapters were conducted with 1 μg RNA according to the manufacturer’s instructions (except that PCR was performed with 10 mM dNTP in a 25 μL reaction). Following ligation of the 5’ and 3’ RNA adapters, cDNA synthesis and PCR amplification, fragments corresponding to adapter-sRNA-adapter ligations (93–100 bp) were excised from polyacrylamide gels and eluted using the manufacturer’s instructions. Sequencing was performed at The Sainsbury Laboratory (TSL, Norwich, UK) for 36 nt single-end sequencing on an Illumina Genome Analyzer. Full details of genome assembly, annotation and quality control are given in Additional file 2. Briefly, the genomes of M. persicae clones G006 and clone O were independently assembled using a combination of short insert paired-end and mate-pair libraries (Additional file 1: Table S1). Clone G006 was assembled with ALLPATHS-LG  and Clone O with ABySS  followed by scaffolding with SPPACE  and gapclosing with SOAP GapCloser . Repetitive elements were annotated in both genomes with the REPET package (v2.0). We then predicted protein-coding genes for each genome using the AUGUSTUS  and Maker  gene annotation pipelines using protein, cDNA and RNA-seq alignments as evidence. A set of integrated gene models was derived from the AUGUSTUS and Maker gene predictions, along with the transcriptome and protein alignments, using EVidenceModeler . Splice variants and UTR features were then added to the integrated EVidenceModeler predicted gene set using PASA . Following these automatic gene annotation steps, manual annotation was performed for genes involved metabolism pathways and a subset of gene families implicated in host adjustment (Additional files 3, 23, 24, 25, 26, 27, 28, 29 and 30). To investigate gene family evolution across arthropods, we compiled a comprehensive set of proteomes for 17 insect lineages plus the branchiopod outgroup Daphnia pulex and the spider mite Tetranychus urticae and combined them with the proteomes of the two newly sequenced M. persicae clones. In total, 22 arthropod proteomes were included with all major insect lineages with publicly available genome sequences represented (Additional file 31: Table S16). In cases where proteomes contained multiple transcripts per gene the transcript with the longest CDS was selected. Although both M. persicae clones were included for clustering, comparisons between species were made using the G006 reference only. Putative gene families within our set of proteomes were identified based on Markov clustering of an all-against-all BLASTP search using the MCL v.12.068 . Blast hits were retained for clustering if they had an E-value less than 1e−5 and if the pair of sequences aligned over at least 50% of the longest sequence in the pair. MCL was then run on the filtered blast hits with an inflation parameter of 2.1 and filtering scheme 6. To estimate species phylogeny, protein sequences for 66 single-copy conserved orthologs were extracted. For each gene, proteins were aligned using muscle v. 3.8.31  followed by removal of poorly aligned regions with trimAl v. 1.2 . The curated alignments were then concatenated into a supermatrix. Phylogenetic relationships were estimated using maximum likelihood (ML) in RAxML v.8.0.23 . The supermatrix alignment was partitioned by gene and RAxML was run with automatic amino acid substitution model selection and gamma distributed rate variation for each partition. One hundred rapid bootstrap replicates were carried out followed by a thorough ML tree search. As the focus of the present study is not on estimating absolute dates of divergence, we used RelTime  to estimate relative divergence times using the RAxML topology. RelTime has been shown to give relative dates of divergence that are well correlated with absolute divergence times derived from the most advanced Bayesian dating methods. RelTime was run with an LG model of protein evolution and the few clocks option (clocks merged on 2 std. errors), treating the supermatrix as a single parition﻿. Gene family evolution across arthropods was investigated using CAFE v.3.0 . CAFE models the evolution of gene family size across a species phylogeny under a ML birth–death model of gene gain and loss and simultaneously reconstructs ML ancestral gene family sizes for all internal nodes, allowing the detection of expanded gene families within lineages. We ran CAFE on our matrix of gene family sizes generated by MCL under a birth–death model of gene family evolution and modelled their evolution along the RelTime species tree. CAFE assumes that gene families are present in the last common ancestor of all species included in the analysis. To avoid biases in estimates of the rate of gene gain and loss, we therefore removed gene families not inferred to be present in the last common ancestor of all taxa in the analysis based on maximum parsimony reconstruction of gene family presence/absence. Initial runs of CAFE produced infinite likelihood scores due to very large changes in family size for some gene families. We therefore excluded gene families where copy number varied between species by more than 200 genes. In total 4983 conserved gene families were included for analysis. To investigate variation in the rate of gene birth and death (λ) across the arthropod phylogeny we tested a series of nested, increasingly complex, models of gene family evolution using likelihood ratio tests . Models tested ranged from one with a single λ parameter across the whole phylogeny to a model with separate λ parameters for each of the major arthropod groups and a separate rate for each aphid species (Additional file 32: Table S17). For a more complex model to be considered an improvement a significant increase in likelihood had to be observed (likelihood ratio test, p < 0.05). For the best fitting model of gene family evolution (‘clade-specific rates’, Additional file 33: Table S18), the average per gene family expansion and the number of expanded families were compared for each taxon included in the analysis. To correct for evolutionary divergence between taxa, average per gene family expansion and the number of expanded gene families were normalised for each taxon by dividing by the relative divergence time from the MRCA of the taxon in question (RelTime tree, branch length from tip to first node). To investigate the history of gene duplication in aphids, we reconstructed the complete set of duplicated genes (paralogs) in M. persicae and A. pisum and calculated the rates of synonymous substitution per synonymous site (d S ) and non-synonymous substitution per non-synonymous site (d N ) between each duplicated gene and its most recent paralog. We then created age distributions for duplicate genes in the two aphid genomes based on d S values between paralogs and compared rates of evolution based on d N /d S ratios. Larger values of d S represent older duplication events and the d N /d S ratio reflects the strength and type of selection acting on the sequences. Paralog pairs were identified by conducting an all-against-all protein similarity search with BLASTP on the proteome of each species with an E-value cutoff of e−10. When multiple transcripts of a gene were present in the proteome the sequence with the longest CDS was used. Paralogous gene pairs were retained if they aligned over at least 150 amino acids with a minimum of 30% identity . For each protein, only the nearest paralog was retained (highest scoring BLASTP hit, excluding self-hits) and reciprocal hits were removed to create a non-redundant set of paralog pairs. For each paralog pair, a protein alignment was generated with muscle v. 3.8.31 . These alignments were then used to guide codon alignments of the CDS of each paralog pair using PAL2NAL . From these codon alignments, pairwise d N and d S values were calculated with paml v4.4 using YN00 . Paralog pairs with d S > 2 were excluded from our analysis as they likely suffer from saturation. For the generation of age distributions, we used all gene pairs that passed our alignment criteria. For comparisons of rates of evolution (d N /d S ), we applied strict filtering criteria to avoid inaccurate d N /d S estimates caused by insufficiently diverged sequences; pairs were removed if they had d N or d S less than 0.01 and fewer than 50 synonymous sites. We also calculated pairwise d N and d S for 1:1 orthologs between M. persicae and A. pisum (extracted from the MCL gene families). This allowed us to separate duplicated genes into ‘old’ (before speciation) and ‘young’ (after speciation) categories depending on whether d S between a paralog pair was larger or smaller than the mean d S between 1:1 orthologs which corresponds to the time of speciation between the two aphid species. Adding 1:1 orthologs also allowed us to compare rates of evolution (d N /d S ) between single-copy and duplicated genes. In addition to the pipeline above, we also identified tandemly duplicated genes in the M. persicae genome using MCSscanX . To identify genes involved in M. persicae host adjustment, we compared the transcriptomes of clone O colonies reared on either B. rapa or N. benthamiana for one year (LIB949 – LIB954, Additional file 22: Table S7). Reads were quality filtered using sickle v1.2  with reads trimmed if their quality fell to below 20 and removed if their length fell to less than 60 bp. The remaining reads were mapped to the G006 reference genome with Bowtie v1.0  and per gene expression levels estimated probabilistically with RSEM v1.2.8 . We identified differentially expressed genes with DEseq  using per gene expected counts for each sample generated by RSEM. To increase statistical power to detect differentially expressed genes, lowly expressed genes falling into the lowest 40% quantile were removed from the analysis. Genes were considered differentially expressed between the two treatments if they had a significant p value after accounting for a 10% FDR according to the Benjamini–Hochberg procedure and if a fold change in expression of at least a 1.5 was observed. To assess the impact of genome assembly and annotation on our results we also repeated the analysis mapping to clone O rather than G006. This resulted in a similar number of differentially expressed genes (171 versus 179) and the same top four gene families with the most members differentially expressed (Additional file 34: Table S19). Total RNA was isolated from adults using Trizol reagent (Invitrogen) and subsequent DNase treatment using an RNase-free DNase I (Fermentas). cDNA was synthesised from 1 μg total RNA with RevertAid First Strand cDNA Synthesis Kit (Fermentas). The qRT-PCRs reactions were performed on CFX96 Touch™ Real-Time PCR Detection System using gene-specific primers (Additional file 35: Table S20). Each reaction was performed in a 20 μL reaction volume containing 10 μL SYBR Green (Fermentas), 0.4 μL Rox Reference Dye II, 1 μL of each primer (10 mM), 1 μL of sample cDNA and 7.6 μL UltraPure Distilled water (Invitrogen). The cycle programs were: 95 °C for 10 s, 40 cycles at 95 °C for 20 s and 60 °C for 30 s. Relative quantification was calculated using the comparative 2–△Ct method . All data were normalised to the level of Tubulin from the same sample. Design of gene-specific primers were achieved by two steps. First, we used PrimerQuest Tool (Integrated DNA Technologies, IA, USA) to generate five to ten qPCR primer pairs for each gene. Then, primer pairs were aligned against cathepsin B and cuticular protein genes. Only primers aligned to unique sequences were used (Additional file 35: Table S20). Genes for which no unique primers could be designed were excluded from analyses. The M. persicae clone O colony reared on B. rapa was reared from a single female and then transferred to A. thaliana and N. benthamiana and reared on these plants for at least 20 generations. Then, third instar nymphs were transferred from A. thaliana to N. benthamiana and vice versa for three days upon which the insects were harvested for RNA extractions and qRT-PCR analyses. A fragment corresponding to the coding sequence of MpCathB4 (Additional file 19) was amplified from M. persicae cDNA by PCR with specific primers containing additional attb1 (ACAAGTTTGTACAAAAAAGCAGGCT) and attb2 linkers (ACCACTTTGTACAAGAAAGCTGGGT) (MpCathB4 attB1 and MpCathB7 attB2, Additional file 35: Table S20) for cloning with the Gateway system (Invitrogen). A 242-bp MpCathB4 fragment was introduced into pDONR207 (Invitrogen) plasmid using Gateway BP reaction and transformed into DH5α. Subsequent clones were sequenced to verify correct size and sequence of inserts. Subsequently, the inserts were introduced into the pJawohl8-RNAi binary silencing vector (kindly provided by I.E. Somssich, Max Planck Institute for Plant Breeding Research, Germany) using Gateway LB reaction generating plasmids pJMpCathB4, which was introduced into A. tumefaciens strain GV3101 containing the pMP90RK helper plasmid for subsequent transformation of A. thaliana using the floral dip method . Seeds obtained from the dipped plants were sown and seedlings were sprayed with phosphinothricin (BASTA) to a selection of transformants. F2 seeds were germinated on Murashige and Skoog (MS) medium supplemented with 20 mg mL BASTA for selection. F2 plants with 3:1 dead/alive segregation of seedlings (evidence of single insertion) were taken forward to the F3 stage. Seeds from F3 plants were sown on MS + BASTA and lines with 100% survival ratio (homozygous) were selected. The presence of pJMpCathB4 transgenes was confirmed by PCR and sequencing. Three independent pJMpCathB4 transgenic lines were taken forward for experiments with aphids. These were At_dsCathB 5–1, 17–5 and 18–2. To assess if the 242-bp MpCathB4 fragment targets sequences beyond cathepsin B genes, 242-bp sequence was blastn-searched against the M. persicae clones G006 and O predicted transcripts at AphidBase and cutoff e-value of 0.01. The sequence aligned to nucleotide sequences of MpCathB1 to B13 and MpCathB17 with the best aligned for MpCathB4 (241/242, 99% identity) and lowest score for MpCathB17 (74/106, 69% identity) (Additional file 19). M. persicae fed on At_dsCathB 5–1, 17–5 and 18–2 transgenic lines had lower transcript levels of AtCathB1 to B11, whereas that of MpCathB12 was not reduced (Fig. 4.1a). Identity percentages of the 242-bp fragment to AtCathB1 to B11 range from 99% to 77%, whereas that of MpCathB12 is 73% (Additional file 19). Thus, identity scores higher than 73–77% are needed to obtain effective RNAi-mediated transcript reduction in M. persicae. Seed of the pJMpCathB4 homozygous lines (expressing dsRNA corresponding to Cathepsin B, dsCathB, Additional file 19) was sown and seedlings were transferred to single pots (10 cm diameter) and transferred to an environmental growth room at temperature 18 °C day/16 °C night under 8 h of light. The aphids were reared for four generations on A. thaliana transgenic plants producing dsGFP (controls) and dsCathB. Five M. persicae adults were confined to single four-week-old A. thaliana lines in sealed experimental cages (15.5 cm diameter and 15.5 cm height) containing the entire plant. Two days later adults were removed and five nymphs remained on the plants. The number of offspring produced on the 10th, 14th and 16th days of the experiment were counted and removed. This experiment was repeated three times to create data from three independent biological replicates with four plants per line per replicate. An erratum to this article is available at http://dx.doi.org/10.1186/s13059-017-1202-6. We thank Brian Fenton (James Hutton Institute, Dundee, UK) for his help with genotyping M. persicae clone O and Linda M. Field (Rothamsted Research, Harpenden, UK) for being a co-investigator on the Capacity and Capability Challenge (CCC-15) project that funded the first round of genome sequencing of M. persicae clone O. We are grateful to Danielle G﻿off-Leggett, Ian Bedford and Gavin Hatt (JIC Insectary) for rearing and care of aphids and the John Innes Horticultural Services for growing the plants used in this study. Next-generation sequencing and library construction was delivered via the BBSRC National Capability in Genomics (BB/J010375/1) at the Earlham Institute (formerly The Genome Analysis Centre), Norwich, by members of the Platforms and Pipelines Group. All assemblies and annotation features are available for download at AphidBase (http://bipaa.genouest.org/is/aphidbase/) . Genome assemblies, annotations, gene family clustering results and host transfer RNAseq gene expression data are also available through the Earlham Institute open data resource at http://opendata.earlham.ac.uk/Myzus_persicae/. Sequence data have been deposited in the sequence read archive at the European Nucleotide Archive (ENA) and are available under BioProject accessions PRJEB11304 (clone O), PRJNA319804 and PRJNA296778 (G006). TM and YC contributed equally to this work and are co-first authors. TM conducted bioinformatics analyses, including gene family clustering, evolutionary analysis, analysis of specific gene families, phylogenetic analysis, tandem duplication analysis and RNA-seq expression analysis, and prepared figures. YC conducted manual annotations of differentially expressed genes, developed the M. persicae host switch method and performed qRT-PCRs, host switch and RNAi experiments, analysed data and prepared figures. STM analysed data, prepared figures, assisted with laboratory experiments and maintained aphid colonies. PL designed and generated dsRNA_cathB constructs for A. thaliana transformation and generated transgenic A. thaliana lines. AW selected the M. persicae clone G006 and isolated genomic DNA and planned library design for this clone. HF and DP dissected bacteriocytes and guts of M. persicae clone G006 and obtained and analysed small RNA transcriptome data from these organs. SH selected and grew the M. persicae clone O, KK prepared DNA, AS prepared RNA for M. persicae clone O genomic and RNA-seq libraries. GJK, TDa and SG prepared M. persicae clone O small RNA libraries and analysed RNA sequence data. AJ reared and harvested M. persicae clone O aphids for host switch experiments. FL, TDe and DLa assembled the M. persicae clone G006 genome and DW the M. persicae clone O genome. BC and DM provided expertise on genome assembly strategies, including quality controls and statistics. FL compared the G006 and O genomes and generated an alternative G006 annotation (available via Aphidbase). 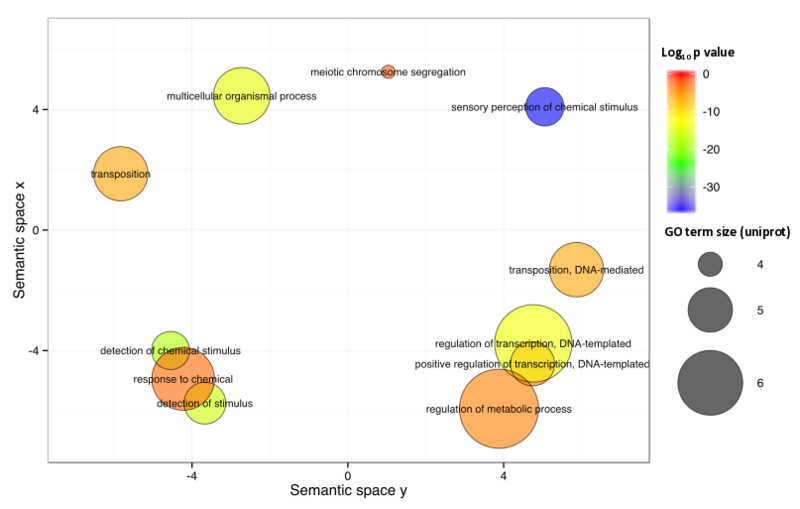 FL and FM annotated transposable elements. GK conducted the gene annotations, data integrations and quality controls of the two M. persicae genomes and prepared files for data release. GJ designed experiments and performed data analyses on metabolism. TG, DLo and IJ provided GO annotation and orthology information from the phylome analysis for the MyzpeCyc databases and performed data analysis on metabolism. SC, MvM and MU manually annotated the cuticular protein genes and performed data analysis for these genes. SM annotated small RNAs. SC and PBP performed metabolism annotation with CycADS pipeline and built the MyzpeCyc databases. FL, AB and OC developed and curated the M. persicae genome page in AphidBase. DS led submission of data for public access to AphidBase, NCBI and other public depositories. SH, DS, CO, AW and GJ conceived the project and secured funding and in collaboration with DT, FL, TG, SC and MvM analysed the data, coordinated the project and paper content. AW supervised analyses conducted by HF and DP. SH supervised analyses conducted by TM, YC, STM, AJ, GK, AS, PL and KK; DS supervised analyses conducted by TM, YC, GK and the remaining EI authors. TM, YC, CO, DS and SH prepared, edited and revised the manuscript; AW, GJ, DT, GK, SC, TG, DLa, SM and MvM wrote various sections and edited the manuscript. All authors read and approved the final manuscript. Joshi NA, Fass JN. Sickle: A sliding-window, adaptive, quality-based trimming tool for FastQ files (Version 1.33) [Software]. 2011, Available at https://github.com/najoshi/sickle.